Oil-Electric: The Train Master - Revisited! Southern Pacific 3031, 3rd Street San Francisco, May 1967. 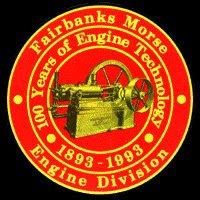 At 66 feet long, this is the Fairbanks-Morse Train Master. "...the most useful locomotive ever built..." Upon its introduction in 1953, the 2,400 horsepower H-24-66 Train Master was the most powerful single-engine diesel locomotive available, until the arrival of the Alco RSD-7 in 1954. The dipping handrail is indicative of the so-called 1b modification. A gaggle of these units shuffled commuters out of 3rd Street Station in San Francisco for years. 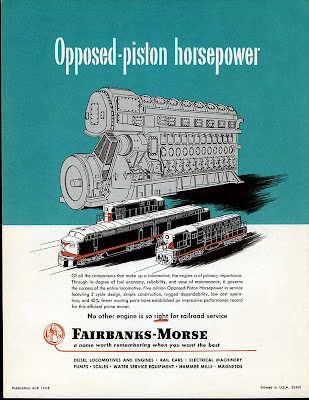 The opposed piston, 2-cycle was touted in a sales brochure, as "No other engine is so right for railroad service!" Indeed! My late Dad was Chief Engineer on a tug that had one of these motors. 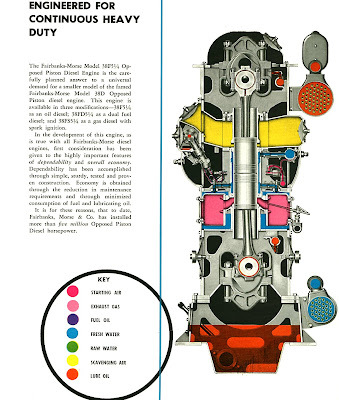 As I recall his comments on the motor were very colorful, especially if the motor crapped out mid-way between Astoria and Honolulu, and repairs were needed on the lower half of this motor. Here be interesting information on the marine applications for the opposed-piston concept. 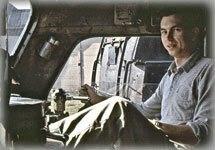 I was stationed at Hamilton AFB from 1963 through 1967, and found photo shoots at South San Francicso, and Oakland (both SP and WP) very friendly, as long as you didn't do something stupid or get in the way. SP 3020 is the first article on FM's Train Masters. How fortunate I was to have seen these beasts in action. Believe me, when they whistled off from 3rd Street, they moved out! Thanks for sharing your memeories! I do recall that sharp exhaust - when they pulled out of 3rd Street Station, you could tell they "meant business!"